Vortex Communications has been supplying cost-effective solutions to broadcast and professional AV users since 1987. Many of our products are Eurocard-based which means apart from standard versions, we can provide custom configurations to meet specific requirements from standard modules. Products have been developed to exceed current broadcast specifications and are designed and built to the highest standards with a proven reliability record. Vortex Communications is open from 9:00 to 17:30 (15:00 Fridays) British Standard Time. Enquiries sent to info@vtx.co.uk will be processed expediently by a member of our team and returned to you within 24 hours. Alternatively click here to contact us or to register your interest. We maintain a test line so that our customers can check their codecs by calling in and although it is not guaranteed to be connected and should not be relied upon, if you call us, we can normally connect the correct device. Please telephone using our Technical Support Number +44-(0)20-8579 2743 to check for availability and compatibility. From the M40 or M1, take the A406 North Circular Road southbound from Hanger Lane Gyratory System to the junction with the A4020 Uxbridge Road, and turn right. From the A4 or M4, leave the M4 at junction 2 and join the A4, then take the A406 northbound from Chiswick Roundabout to the junction with the A4020 Uxbridge Road, and turn left. From the M3, continue towards London on the A316 Chertsey Road to the Quadrant Roundabout at Richmond, take the first exit (A307 Kew Road) and follow directions for the A406 North Circular Road, which starts at Chiswick Roundabout. Follow the A406 to the junction with the A4020 Uxbridge Road, and turn left. Then, take the first turning left (alongside the Common) and the first turning right (The Grove). Cross a junction and our offices are just past the next turning on the right. If you're coming by public transport, we are 5 minutes walk from Ealing Broadway, which is served by rail from Paddington, Heathrow, Reading and Oxford, and the Central and District Lines. Turn left out of the station entrance, left when you meet the main road, then first right into Windsor Road. Turn first right again into The Grove, and you'll find the office 50yds along on the right. 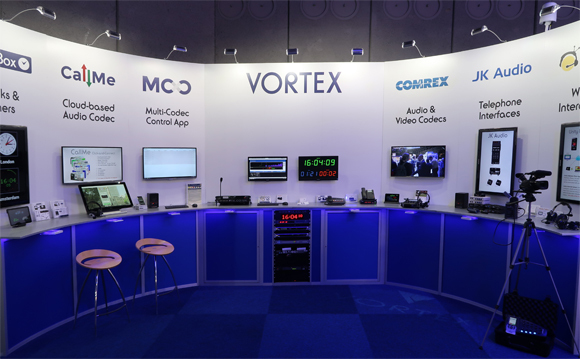 Vortex has exhibited at every IBC since 1987 and will be exhibiting again at IBC 2019 in Amsterdam, Holland from 13th-17th September. You will find us in our usual spot - in hall 12 just inside the doors and in the corner. At the top of the escalators to Halls 10, 11, 12 at the entrance to IBC, turn left then left again. For more information on the exhibition, including details of exhibits and attendees, click here to access the IBC website. 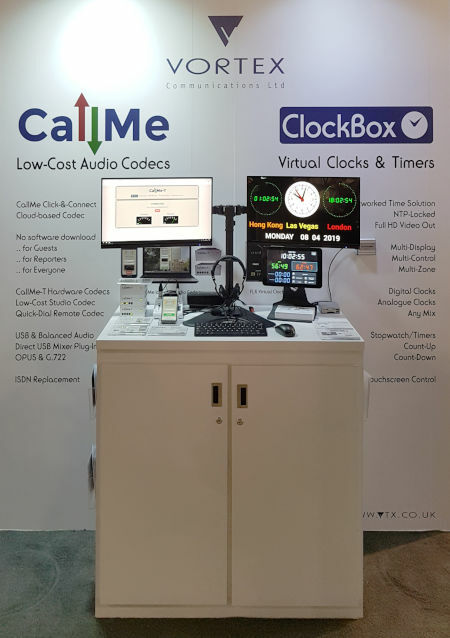 Vortex is exhibiting at the 2019 NAB Show from 8-11 April. Head over to our booth SL5025B in the GB Pavilion in the South Lower hall to see our latest products. For more information on the exhibition from the NAB Show website, click here.